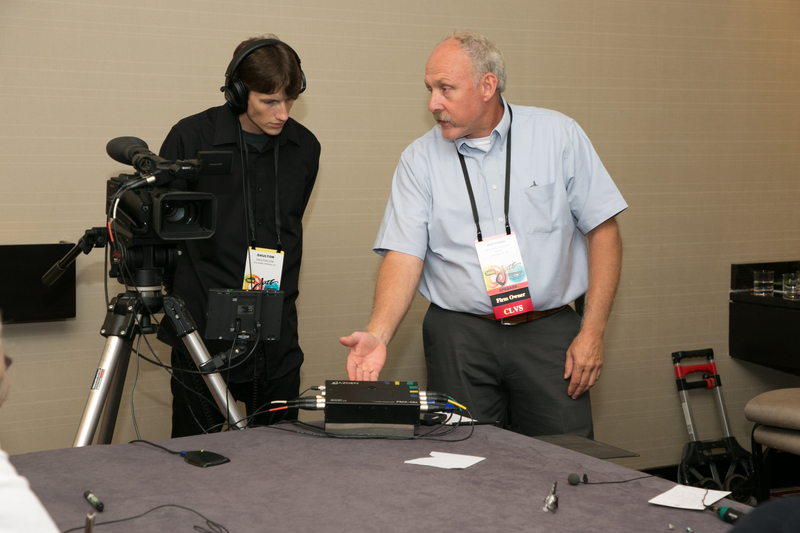 Registration is now open for the next Certified Legal Videographer Production Exam being held Nov. 9-10, at NCRA’s headquarters in Reston, Va. Space is limited so candidates are encouraged to sign up early before registration closes on Oct. 31. Candidates who attend the November dates will also have the opportunity to participate in the new hands-on training session held prior to the production exam. “We did not have a hands-on class when I took my practical test,” said Mindy Sindiong, CLVS, owner of De Bene Esse Media in Cincinnati, Ohio, and co-chair of NCRA’s CLVS Council. The Council leads the CLVS Seminar and administers the Production Exam. “Having the hands-on session would have saved a lot of worry and anxiety had I been able to take it,” added Sindiong, who has been a CLVS for 15 years. During the hands-on session, CLVS candidates have the opportunity to go over the practical test, participate in a mock deposition, and gain valuable experience with the camera they will be using in the test. According to Sindiong, all of the students who participated in the first hands-on session before the June production exam passed it. The only student who failed the production exam did not participate in the hands-on session. “Having the ability to experience different live scenarios and ask questions for clarification helped to ease the nervousness,” said Fred Lester, owner of Big Herc Productions based in Miami, Fla.
“The instructors were very helpful and eager to aid us through this task and to help us better understand the methods in which to perform this task. Prior to this hands-on class, I was very unsure of the process and some camera settings from just reading the material and practicing mock setups on my own,” Lester noted. “This allowed me to better familiarize myself with the equipment and its settings, and it made clear to me the correct process in which the video deposition should flow. Going through a mock video deposition and being critiqued definitely helped me to be confident and better prepared to perform this process at a high level,” he added. During the Production Exam, candidates will run the show at a staged deposition and be graded on their ability to follow video deposition guidelines and to produce a usable, high-quality video of the deposition. 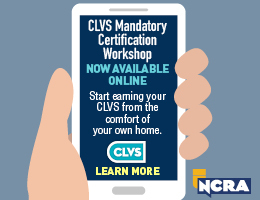 Candidates must have taken the mandatory CLVS Certification Workshop first, available online through InReach. Candidates must complete the educational components prior to taking the CLVS Production Exam. Candidates are strongly encouraged to complete the educational components first, as questions on the CLVS Written Knowledge Test (WKT) are developed from the materials provided. Candidates can take the CLVS WKT in January, April, July, and October each year. Chris Galvin, from Guilford, Conn., who earned his CLVS after he passed the June production exam, said he found the hands-on session of the training to be very important preparation for the production exam because it gave him the opportunity to become familiar with the kind of equipment used in the test. “Although I have experience with other kinds of videography, I am a total newbie in the legal video world. I wanted to get certification, which I did, before I started exploring entry into the field. I am wrapping up other projects and am looking to start that transition very soon,” he said. “My own equipment is different in enough ways that it may have cost precious seconds or minutes in adjusting to the testing equipment if not familiar with it. The pressure of a timed test can throw your normal thinking process off too, so the more familiar you are with the steps you need to take, the more automatic your performance will be,” Galvin noted. The CLVS Production Exam is administered two times a year: spring and fall (depending on interest). The cost of the exam is $325 for NCRA members and $425 for nonmembers. To learn more about the CLVS program, visit NCRA.org/CLVS or to register for the November Production Exam and/or Hands-on Session. O’Brien & Levine was voted the #1 best court reporting and video deposition company for the second consecutive year by readers of the Massachusetts Lawyers Weekly. Markets Insider reported on July 30, that three more major industry leaders serving or representing stenographic court reporters, captioners, and legal videographers, have signed on to NCRA’s Corporate Partnership program. The Realtime and Technology Resource Committee is taking your questions on topics surrounding realtime and technology. Send the questions you want the technology committee members to tackle to jcrfeedback@ncra.org. I’m in the market for a new mixer. Do you have any recommendations? It’s always great when you have the opportunity to update or upgrade your equipment, and doing so proactively lets you really research your choices. Good luck on finding the one that’s right for you! There are many options available for a mixer out on the market, but our needs can be so specific. Here are our suggestions. 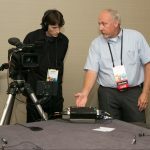 Lou Chiodo, CLVS, a videographer who has also earned NCRA’s Realtime Systems Administrator and Trial Presentation Professional certificates, of New York City, N.Y.: I recently added the Zoom F8 – Recorder/Mixer into my deposition kit. I cannot say this is an inexpensive audio solution; however, I do believe that it is a crucial item in my audio workflow. It is a professional field mixer and sophisticated recorder in one, with eight channels, in a lightweight, aluminum, tiny form factor. It comes with flexible SD card recording options, providing redundant recording; safety track recording; or a combination of isolated channels with a second mix containing all channels. If this mixer/recorder combo is for you, it is readily available online for $799 – originally priced at $1,000. My preferred setup for recording audio for court reporters or their scopists is to always keep one of the left or right channel, peak signal levels, slightly lower or behind the other channel for safer recording and to prevent distortion or clipping. I then record all individual channels onto one SD card and a mix of all channels onto the other SD card during the deposition. The files are then available for immediate transfer to the reporter, especially for a next-day expedite. Alan Peacock, FAPR, RDR, CRR, CRC, a freelance court reporter and captioner based in Mobile, Ala.: I do use a mixer for my court work. I like the Rolls MX410 4-Channel Microphone Mixer. I think professional XLR connections provide the best quality audio for any mixer, which is what most videographers use as well. You can buy the XLR in a variety of different lengths, so you can accommodate almost any room. For captioning, I just use a simple Pyle Pro amp. What’s most important to me is the headset. You need something super light, since you’re wearing it most of the day. I prefer a full ear cup, so my favorite headset is the Bose Quietcomfort. You can find wired and wireless versions out there. Most of the wired ones have been retired, but there are plenty on eBay right now that you can get at a reduced price. Scott Aaron, a videographer based in Memphis, Tenn.: I utilize the Shure SCM268 Microphone Mixer for my audio recording during depositions. It has four transformer balanced XLR microphone inputs and one transformer balanced XLR mic/line output. 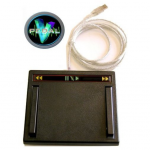 Each of the four line inputs are adjusted individually, giving you control for each person using a lapel mic. As with most mixers, the volume adjustments are easily made, ensuring a great-sounding final product. The main reasons I chose this mixer are: 1) Reliability: This mixer has been tried and tested for many years with excellent reviews; 2) Compact size; 3) Cost: Around $200-$250. I have used this mixer for 11 years and have never had any issues. Cheryl Erwin, a videographer, Nashville, Tenn.: Looking for the perfect audio mixer for depositions was a challenge. Most of the mixers we considered had far more functions than we needed. We did not need three bands of EQ or built-in effects. What we did need was a mixer that was lightweight and portable, with XLR inputs for good quality. We decided upon the ROLLS ProMIX-IV. It’s a four-channel mixer with four XLR connectors in and two out. 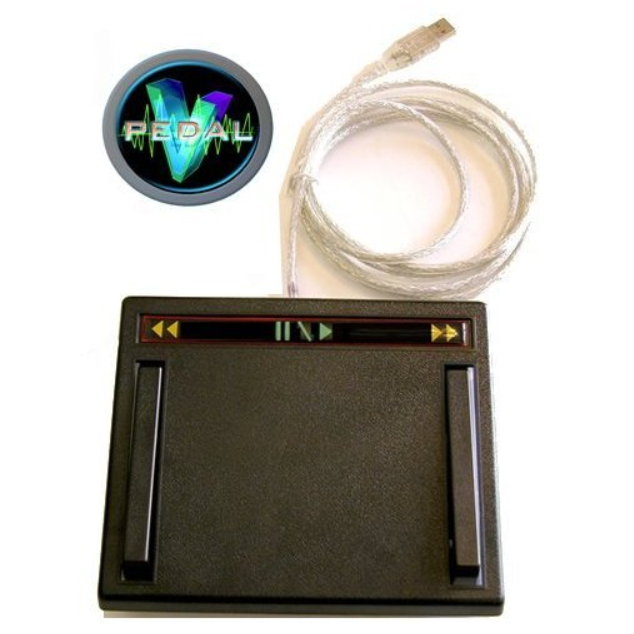 It has four rotating input volume controls and two auxiliary out connectors, 1/4-inch phone plug, and a mini plug. This mixer also has 48-volt phantom power, which we don’t use because we have battery-powered condenser microphones. 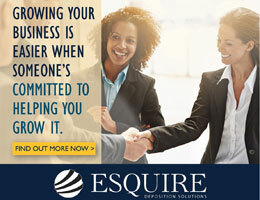 We have found that EQ is not necessary and four microphones are enough for most depositions. This mixer sells for about $150, it’s lightweight and fairly small, 6 in. x 4 in. x 3 in. The audio quality is outstanding! Rob Sawyer, a videographer based in Memphis, Tenn.: I have used Yamaha and Peavey over the years for audio/video deposition units. All these units have four pro-level XLR inputs with individual volume controls for each microphone plus a master level and a separate level for the output. The mixed output is used to send the audio to the court reporter’s computer or audio recording device. Four inputs allows separate mics for each primary opposing lawyer, the deponent, and an overall room mic. The room mic is used primarily as a backup. I like Yamaha the best because it is compact and durable. The cost is usually $150-$200. Julie Coulston, a videographer based in Jackson, Tenn.: I use a Shure Mixer that I purchased five or six years ago, and I am almost positive it has been replaced by a newer version, so I wouldn’t know which one to recommend to new videographers. For the court reporter audio, I use a TASCAM recorder that records onto an SD card. I can give it to the reporter on site, or I can email them the audio, which the reporter can download when convenient. In a press release issued June 26, Nexdep announced the launch of its new on-demand litigation support platform that serves both litigation professionals and court reporters. The platform allows attorneys and paralegals to instantly connect with available court reporters, legal videographers, and interpreters for legal field work. Spots are filling fast, and the deadlines for lodging and registration are looming for NCRA’s 2018 Convention & Expo taking place Aug. 2-5 in New Orleans, La. July 6 marks the deadline to reserve a room at the Hyatt Regency New Orleans using NCRA’s special discount, a deal that also gets you a free breakfast on Friday and Saturday (a $75 value). Save more by registering for the Convention & Expo before July 23, when online registration closes, and avoid a $100 additional fee for onsite registration. This year’s all-inclusive schedule is sure to appeal to anyone in the court reporting, captioning, and legal video professions, or in the educational arena. But hurry; there are only 28 spots available for the ever-popular Punctuation Workshop, 18 spots for the National Speed Contest, and 15 spots for the National Realtime Contest. Last year, all three of these events sold out, so don’t miss your chance this year. Other Learning Zones that will offer attendees added opportunities to mingle and network. Throughout the Convention, attendees can earn up to 2.3 CEUs. The Keynote speaker for NCRA’s 2018 Convention & Expo is Lt. Gen. Russel L. Honoré (U.S. Army, Ret. ), a 37-year veteran of active service who served as the commander of Joint Task Force Katrina, during which time he became known as the “Category 5 General” for his striking leadership style in coordinating military relief efforts in post-hurricane New Orleans. In addition to sharing insights into his leadership skills with attendees at the premier session, Honoré will write his military story in a special Veterans History Project event. Honoré will be interviewed on stage by NCRA member Michael Miller, FAPR, RDR, CRR, a freelance court reporter from Houston, Texas. Accompanying Miller on stage will be NCRA member Daniel Griffin, RPR, a freelance reporter from Phoenix, Ariz., who will transcribe Honoré’s story. Once completed, Honoré’s story will be preserved at the Library of Congress in Washington, D.C., as part of its VHP program. 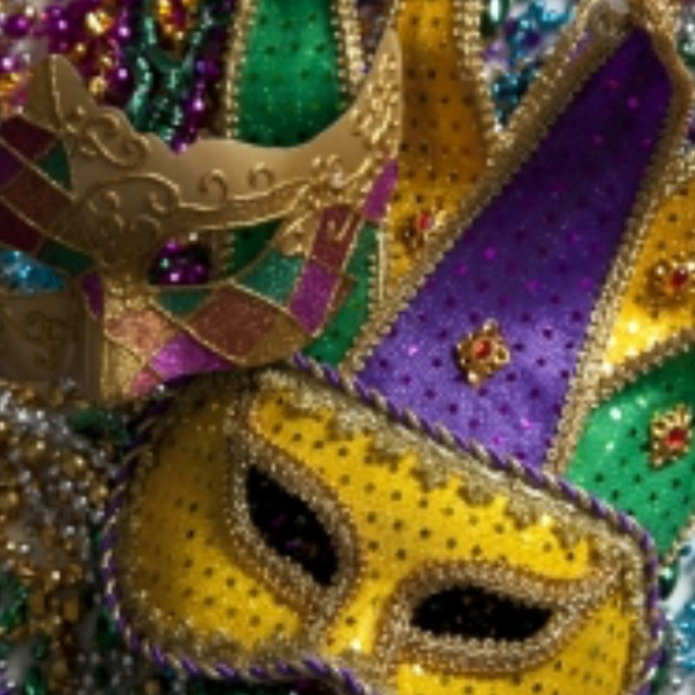 Get into the New Orleans mood even more by checking out this party playlist of songs selected by NCRA’s Board and Staff to get everyone excited to meet at the 2018 NCRA Convention & Expo! For more information about the 2018 NCRA Annual Convention & Expo, or to register, visit NCRA.org/Convention. 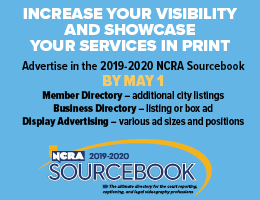 For information about sponsorship opportunities, contact Mary Petto, Senior Director of External Affairs at mpetto@ncra.org. The Realtime and Technology Resource Committee is taking your questions on topics surrounding realtime and technology. Send the questions you want the Committee members to tackle to jcrfeedback@ncra.org. 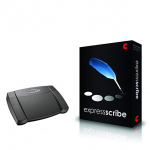 I am a court reporter who freelances with several different court reporting agencies. My trusty laptop is on its last legs, so I am going to purchase a new computer and will use my existing machine for backup purposes. One of my upcoming assignments is a jury trial — a first for me. The courtroom is in an old courthouse and so I am unsure about the acoustics and whether I will be able to hear all of the participants. The voir dire is scaring me to death, actually. There will be no microphones for prospective jurors. I need my backup media to be as clear as possible. Yikes! Please help! I need some guidance about which microphone options I should be considering. Good luck on your upcoming assignment. It’s always good to go in prepared to handle anything. Here are a few recommendations from some of the Committee members. Myrina Kleinschmidt, RMR, CRR, CRC, a freelancer and agency owner in Wayzata, Minn.: I have used many great microphones. Now I am using the SoundTech CM-1000 3.5 mm Omni-directional Conference Microphone. I use the SoundTech to connect to my separate recorder (Marantz Professional, which is plugged into a power strip). I have connected up to three via daisy chaining down a long conference table. There’s a USB version if you want to connect to a computer and then daisy chain more from there. The microphone costs about $39. I currently use CaseCat and DigitalCAT, and I have a Dell Latitude; but I do not use a microphone with my computer at this time. In the past, I used the DepoBook Stealth Microphone and that was a plug and play, which worked well with my Latitude. Since all software and computers have different audio systems, it’s best to have your CAT company and the microphone company help you get the settings perfected. I like the low profile of the SoundTech, the daisy chaining ability, and the fact the SoundTech can be plugged into my computer (USB version), sound amplifier (Pocketalker), or recorder. I don’t use a microphone connected to my computer. I use the Williams Sound Pocketalker (personal amplifier, $189) on many of my depos. The SoundTechs connect to the Pocketalker as well. I set it all up and have it ready to go — if the deponent is difficult to hear, I then turn it on at the next break, or stop the proceedings and turn it on if need be. When I can hear the words more clearly in the first place while writing, I write better, have a better record, which means that I have an easier time editing and I am less tired at the end of the day. Recently, I connected a lapel mic (Sony ECMCS3 Clip style Omnidirectional Stereo Microphone – about $20) to a low-speaking witness. The lapel mic was connected to the Pocketalker and then I had an earbud to listen with one ear. Also I recently used the Pocketalker on a two-week arbitration where the background noise was awful. I again connected lapel mics (using a splitter cable so as to have both mics go into the Pocketalker) and had the witness and the questioning attorney wear the mics. The arbitrators kept asking participants to repeat, while I had no difficulty hearing. Lynette L. Mueller, FAPR, RDR, CRR, is a freelancer based in Memphis, Tenn.: I use the MXL AC-404 Conference microphone. 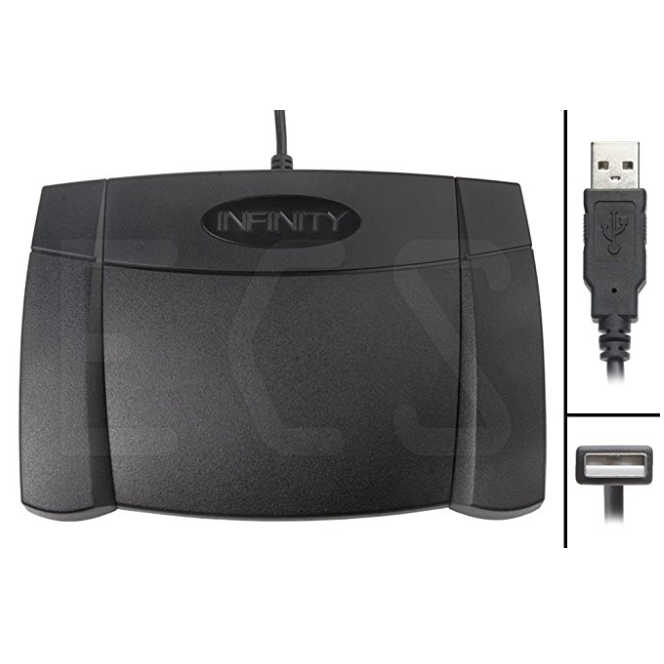 This microphone is designed to capture crystal-clear intelligibility for multiple uses and has easy plug-in-play connectivity. Bonus: There are no drivers to download! It is compatible with Windows and Mac. For my Luminex, I utilize the Martel HGM-2. The cost is about $99, but check online for the best price. Some vendors offer free shipping. My go-to sources are either Amazon or B&H Photo Video. The cost of the HGM-2 is around $179. As a freelancer, my court reporting assignments involve a variety of venues: depositions, arbitrations, hearings, and courtrooms. The number-one reason I landed with the MXL microphone is for the judicial reporting aspect. Backup media is an important tool for us. I go into several different courtrooms and am the official court reporter for trials and hearings. I wanted to ensure a seamless way to handle bench conferences. Since the courtrooms are on the small-ish side, it is easier to stay in my seat, slap some headphones on, and I’m ready to roll! Some other court reporters were using Scotch tape to adhere their microphone to the judge’s bench. Needless to say, the finish is wearing off on his bench. This conference mic has a low profile and will lay flat on any surface. The second reason I bought the MXL was for the sound quality. I’ve utilized several different brands of PCs over the past five years. Each laptop has different specs for the audio quality. With each one of my purchases, though, this mic has always enhanced my BAM with generally no concerns. The third reason was the USB plug-in-play. I like the idea of never having to install drivers. When I do have the need to switch to my backup computer, I know I am ready to go at a moment’s notice because of the plug-in-play feature. Keith Lemons, FAPR, RPR, CRR, a freelancer based in Brentwood, Tenn., (and frequent JCR contributor): It depends on the venue. Right now, for most applications, I use my HGMUSB mic and set it up on the table for a deposition or on a tripod at the bench for bench conferences and normal courtroom sound. I also have purchased the SP-USB-Mic-Model-6-Plus from Sound Professionals that I can also use as a standalone mic in depos, or with two boundary mics at the bench and at the witness stand via a 10-foot cord. It sells for about $300 from Martel. The Model 6 plus with the boundary mics was about $525 together. I’m currently on Case CATalyst, and I use the default settings on the USB mics. Using the noise-canceling feature may work in some really bad deposition suites, but I’ve found that noise canceling will keep you from hearing the whispered bench conferences. Most of the time, I keep the mics at about 80-90 percent, keeping watch on the sound bar provided by my CAT system. If it starts to run to red, I reduce the volume. If it barely registers, I increase it. I set my systems to always listen and set my default audio as the USB devices. That forces you to use an earbud or headphones to monitor or play back. But there’s nothing worse than having your monitor be your system speakers: You cannot stop the caterwauling feedback quickly enough. I’ve bought the cheap ones and the not-so cheap ones. Frankly, I had a lot of problems because the Lenovo Yoga Power Converter interfered horribly with all of my USB mics. Once I bought a different computer, I could hear again with crystal clarity. So my reasons for setting on the HGMUSB mic were: 1) Reliability; 2) Sound clarity; and 3) Ability to adjust the sound easily. All USB devices are similar. Cost is not a true consideration when a lot of my cases are realtime jury trials. I have to hear. These mics (and a great pair of Bose headphones) allow me to hear the bench conferences without too much difficulty. As far as microphones for my writer, I use the Martel HGM-2. It’s a condenser mic with a battery that lasts forever, almost. I’ve used this mic on my writer as a backup to the CAT system numerous times. A USB is subject to audio environmental whims more often than I’d like, and the writer backup stays consistently outstanding. 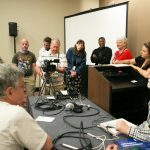 Lou Chiodo, CLVS, a videographer who has also earned NCRA’s Realtime Systems Administrator and Trial Presentation Professional certificates, of New York City, N.Y.: I use the following two types of microphones in every deposition. These particular models are somewhat pricey, but I believe the audio is as important or likely more important than the images. If you want a demonstration of why, put the news on your TV at home sometime and move to the next room; and you will (if audible) hear and understand the information. Try that with the picture only — and even stay in the room — and it likely will not convey the information being provided. The U841A from Audio-Technica is an omnidirectional condenser boundary microphone for surface-mount applications. 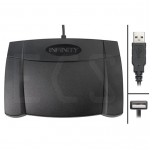 It is designed for surface-mount applications such as sound reinforcement, conferencing, television sound, and more. A boundary microphone is essentially a small diaphragm condenser mic mounted in a housing that directs the diaphragm parallel to the surface onto which it’s mounted. You can see a diagram of a boundary mic’s setup in the illustration above. The parallel setup allows the mic to pick up the sound that is reflected off the surface that it’s mounted to, such as a wall or table. A press release announcing NCRA’s 2018 Convention & Expo was posted on June 7 by Global Newswire and Networking@IT Business Net.